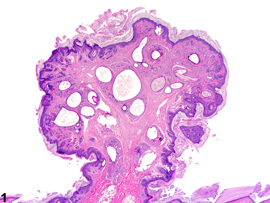 Fibroadnexal hamartoma-exophytic growth composed of dilated hair follicles and overlying hyperplastic epithelium in a female F344/N rat from a chronic study. 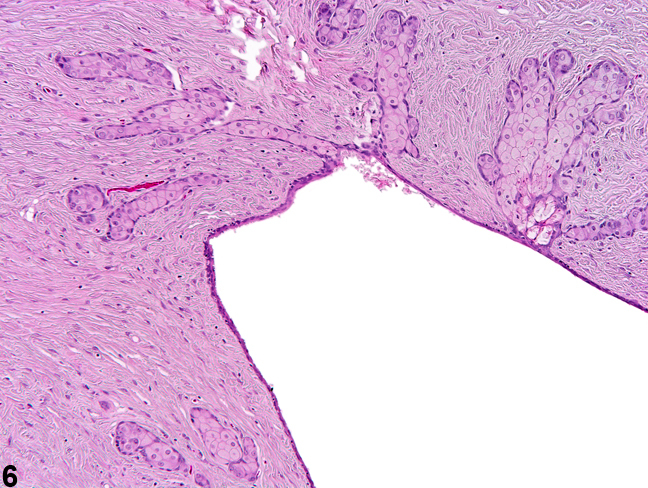 Fibroadnexal hamartoma-flat lesion composed of fibrous connective tissue and dilated follicles lined by flattened epithelium in a male F344/N rat from a chronic study. 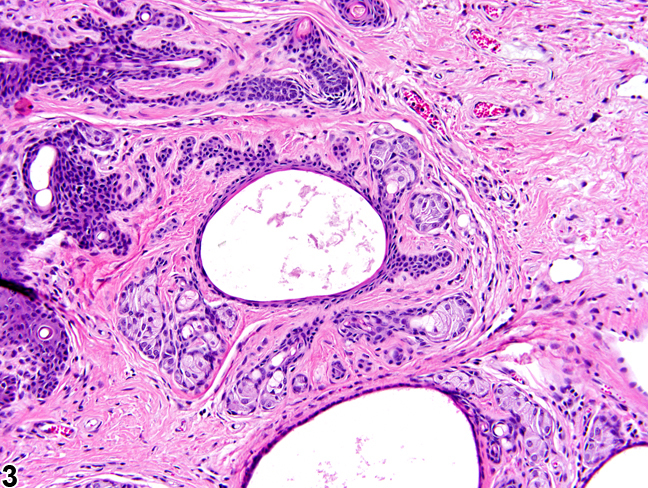 Fibroadnexal hamartomas are uncommon spontaneous lesions. They consist of one or more pilosebaceous units in which the hair follicle is usually dilated and may be surrounded by abundant fibrous connective tissue ( Figure 4 , Figure 5 , and Figure 6 ). The epithelium of the hair follicle may be flattened ( Figure 5 and Figure 6 ), or it may be slightly hyperplastic with projections into the surrounding connective tissue ( Figure 3 ). Multiple sebaceous glands are often associated with a single follicle. 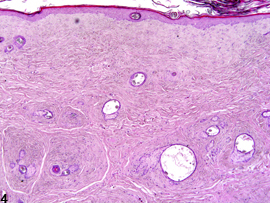 The overlying epidermis is often hyperplastic and hyperkeratotic. The lesions may be exophytic ( Figure 1 , Figure 2 , and Figure 3 ) or flat ( Figure 4 , Figure 5 , and Figure 6 ). 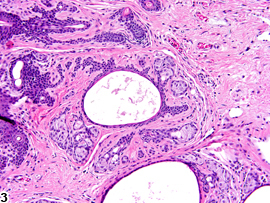 The pathogenesis of these lesions is unknown. 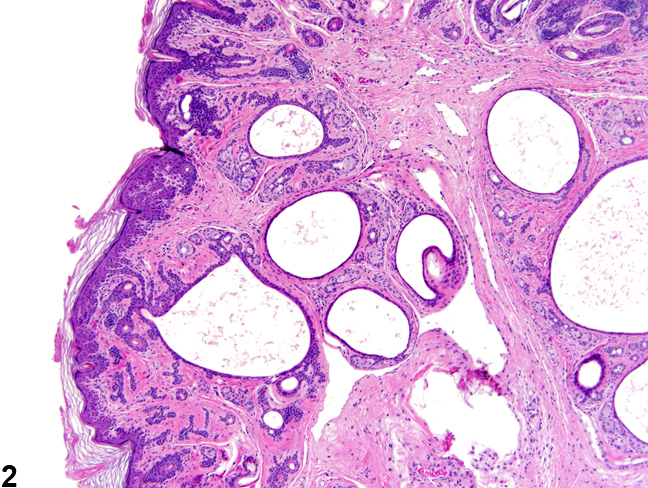 They are dysplastic lesions but are not likely to be preneoplastic. It is unknown if they develop as an abnormal healing response at sites of trauma or if they are congenital. Of 6 hamartomas identified in the NTP database, 4 have been seen in rats and 2 in mice. 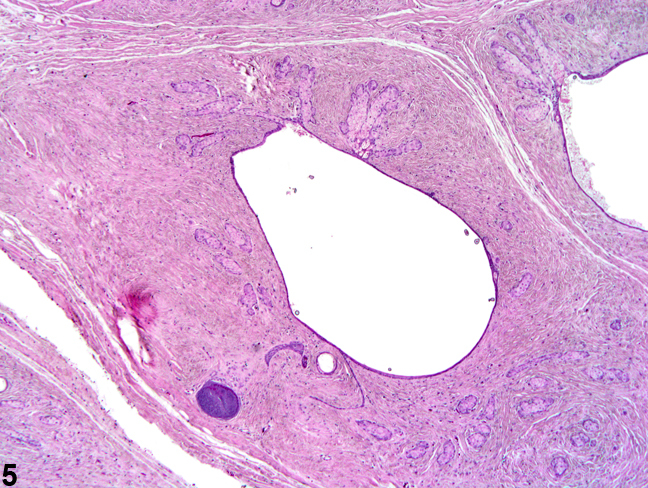 One occurred in a female rat; all others occurred in males. 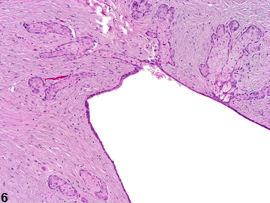 These lesions are occasionally observed grossly at necropsy and require a correlating histologic diagnosis. Therefore, they should be diagnosed whenever present but should not be assigned a severity grade.